Routinely voted the world's best airport, Changi is symbolic of Singapore's progressive and pragmatic governing policies, transforming this country over 50 years into a booming metropolis with home ownership of more than 90%, low income housing for the poor, safe and clean streets and even a government sponsored network to help singles find a life partner. All this despite being the second most densely populated nation in the world! It's not surprising that the airport is focused on creating the best possible experience for its visitors and transit passengers, with transit hotels, a safe and efficient metro system, spas, free movie theaters, free city tours, an affordable Singapore street food experience, free massage chairs, free wifi, a snooze lounge, a butterfly garden and nature walk. With a flight landing, on average, every ninety seconds, there's no doubt that this busy airport continues to be a favorite of travelers flying in and out of SE Asia as well as transiting en-route to Europe, Australia and New Zealand or the Americas. The next time there's a long haul flight in your future, transit through Singapore for a superior airport experience. We've included some ideas for interesting tours and activities. Travling downtown is a breeze on the reliable metro from Changi, a 40-minute ride from the airport. 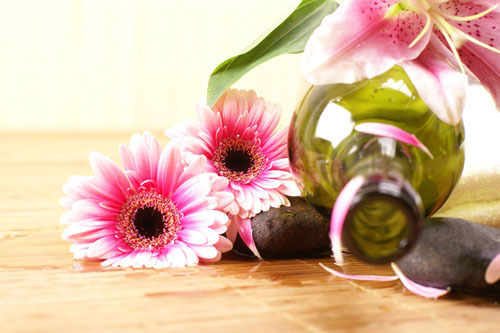 Located in the Ambassador Transit Hotel at T2, this spa offers a number of treatments at reasonable rates. Get a shampoo and blow dry for S$25, a manicure or a pedicure for S$40 or a quick head and shoulder massage for around S$30. Remember that all terminals can be accessed post-security by skytrain or walking. 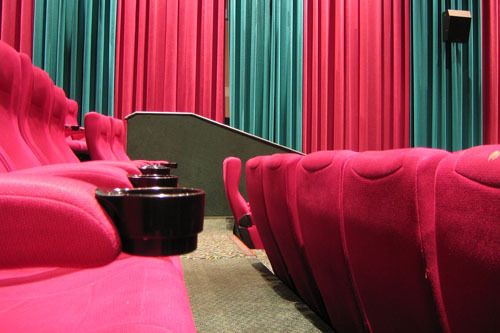 Sink into comfortable movie seats and catch the latest movies 24 hours a day on a massive 100-inch screen. Free entry! Escape the air conditioning to shake off jet lag with a stroll around Changi airport’s very own ‘wilderness’. 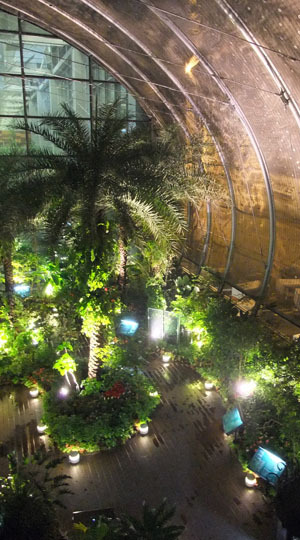 Access spiky cactus gardens from Terminal 1 or the butterfly garden, built around a six-meter waterfall, from Terminal 3. Giant ferns and a blaze of orchids – Singapore’s national flower – surround the koi ponds outside Terminal 2, where the walkways of the sunflower garden turn into an electrifying light show by night, with thousands of tiny bulbs illuminating the shadows and pathways. Relax and rejuvenate in between flights in the tranquil Green Market, a casual Japanese restaurant, at Singapore Changi Airport. Located in the restricted area of Terminal 2, the Green Market includes table-served fresh food plus a healthy, all-you-can-eat salad and dessert buffet with tea and coffee. Enjoy high-speed internet access and a news library as you refresh. Choose a 3-, 6- or 12-hour option depending on the length of time you need before boarding your connecting flight. After many long hours traveling with movement constraints aboard a plane, nothing is more inviting at the airport than a spacious and tranquil environment in which to relax. Singapore Changi Airportâ€™s Green Market restaurant promotes a health-conscious lifestyle in natural surroundings, uniquely designed to help you rejuvenate. This area provides a comfortable place to unwind and dine over quality food. 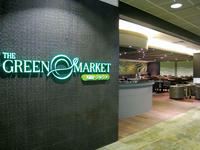 No matter if you are traveling alone, or with family or friends, the Green Market is an ideal place for you to refresh. Upon arrival at the Green Market, you will be able to enjoy the table-served fresh food and the all-you-can-eat salad and dessert bar along with coffee and tea. Internet and email access, as well as points for laptop computers, are available for travelers to keep in touch with family and friends during transit. The library houses international newspapers and magazines for your perusal. The Green Market, available with a 3-, 6- or 12-hour pass, is the perfect solution to all your transit woes! Please note: Your flight must be a departure in order for you to be able to access the Green Market. It is located in the restricted area of the Departures level of the airport and requires that all passengers present an on-going boarding pass before entering. Savor local food, explore a street market and stroll through serene gardens in Singapore with this hop-on hop-off bus tour by night! Your 3-hour guided sightseeing adventure includes a romantic river cruise down the Singapore River and provides outstanding views of the illuminated city skyline from the upper deck of an open-top bus. You can watch a lightshow at Gardens by the Bay, shop at Bugis Village and dance the night away at a nightclub in Clarke Quay. Your tour includes six stops with complimentary food voucher. From Suntec City/Flyer, board your open-top sightseeing bus, which departs at 6:30pm. This hop-on hop-off bus tour makes six stops at top attractions (see Itinerary), where you can get out and explore with your guide. Your first stop is Singapore Flyer’s Food Trail, where you'll learn about local food culture from your guide as you sample traditional dishes. With your complimentary $5 voucher, choose from a selection of Singapore’s most popular cuisines! Next, stroll around the magnificent Gardens by the Bay before heading to the Super Tree Grove for a close-up look at the vertical gardens. Watch the captivating light-and-sound show where the trees come to life in color with majestic music. From here, re-board the bus and head to Bugis Village to experience the mayhem of Singapore’s largest street market. If you’d like, bargain with local vendors as you shop for Singapore souvenirs or sample some local tropical fruit. After you’ve had your fill, embark on a guided cruise over the Singapore River with a romantic ride aboard a historical bumboat. You’ll be mesmerized by the mix of old and new developments lining the Marina Bay and see top attractions such as the Asian Civilizations Museum from the water. End your evening at Clarke Quay, a dining and entertainment area filled with popular drinking holes and clubs, where you can party throughout the night. Alternatively, resume your ride aboard the bus and hop off at Orchard Road, Singapore’s prime shopping area bursting with designer goods. When you’re ready to end your night of fun in Singapore, you can make your own way back to your hotel. Retrace the colonial history of Singapore on a jam-packed half-day tour. Highlighting the influence of Sir Stamford Raffles, the 4.5-hour afternoon tour takes in Singapore's elegant Raffles Hotel and Raffles Landing Site. You'll indulge in an afternoon tea buffet at the Raffles Hotel's renowned Tiffin Room or enjoy afternoon tea of tea and cake at a traditional Chinese bakery. You'll then take a cruise along the Singapore River to Clarke Quay. Sir Stamford Raffles played an enormous role in Singapore's history, founding a British colony here in 1819. His vision for Singapore's future came true, and Singapore became a vital international port and trading center for the Far East. You'll retrace the course of Sir Stamford Raffles' dream on your Raffles Hotel Singapore tour, visiting the site where Raffles first set foot in 1819. The highlight, of course, is visiting the center of high-society colonial Singapore, the stylish Raffles Hotel. The river cruise by bumboat, the traditional vessels that ferried cargo up and down the river in times gone by, is another highlight of your Raffles Hotel Singapore tour. Today your bumboat will steer you along the historic Singapore River, past colonial buildings, Chinese shop houses and the modern skyscrapers of Singapore's business district. The cruise ends at Clarke Quay, a riverside festival village. If you have a layover at Changi Airport in Singapore, spend it at the Plaza Premium Lounge where you can relax and rejuvenate before catching your connecting flight. The lounge provides first-class service and modern facilities like high-speed internet access, a variety of food and beverages, neck and shoulder massages, and hot showers. Get comfortable in an armchair or sofa, enjoy a drink or bite to eat, and be entertained by your choice of international newspapers, magazines or TV channels. Choose a 3-, 6- or 12-hour pass to suit the length of time you require. With a pass to the Plaza Premium Lounge, you'll be welcomed with superior service and comfortable surroundings that allow you to rest and recharge between flights. It's a peaceful retreat from the commotion of Singapore's bustling Changi Airport. The lounge is open 24 hours a day and provides services and amenities that help ease the fatigue of a long day of travel. Take a hot shower, use the high-speed wireless internet, and sip a cup of freshly brewed coffee or tea while relaxing on one of the plush sofas or armchairs. Alcoholic beverages, neck and shoulder massages, rest suites and meeting rooms are also available for an additional fee. When booking, choose a 3-hour, 6-hour or 12-hour pass to give you the time you need based on the length of your layover. When it's time to board your next flight, you'll be revitalized and ready to go. Click the 'View additional info' link to see lounge location.